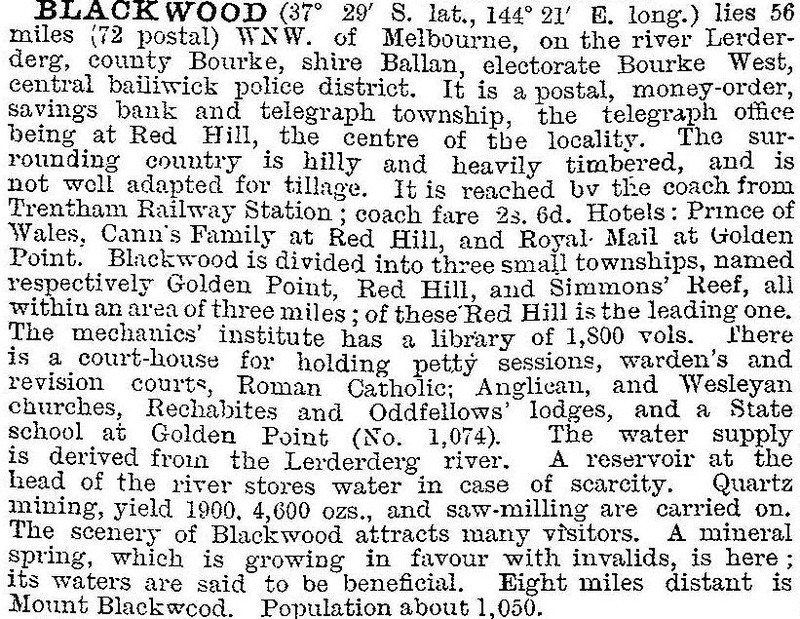 Blackwood is a rural township which was once a gold mining area, in the belt of gold bearing country extending from there to Castlemaine. It is in the Wombat State Forest, in which there are the headwaters of the Lerderderg River. The river flows close to the township. To the south there is the Western Highway, and Ballan 16 km away. Gold was discovered at Blackwood in 1854. Its relative inaccessibility prevented heavy gold mining machinery being brought in, and it became a field mainly worked by individual miners. It reputedly had a population of 15,000 in 1855, when an Anglican school was opened at one of Blackwood's three 'suburbs', Golden Point. The present Anglican church was opened in 1865, and a mechanics' institute in 1869. For the first few years substantial nuggets were taken alluvially from the Lerderderg headwaters and gullies, and sluicing yielded good returns when heavy winter rains made the gullies hard to work. Chinese worked imperfectly treated clays and sluicing waste at Golden Point, near the site of the Blackwood swimming pool. Quartz mining was done at Simmons Reef, west of the township, where several companies sunk shafts. The richest was the Sultan mine at Barry's Reef. By 1930 Blackwood's population fell to fewer than 200 people, where it remained for over 50 years. The primary school closed in 1969. In 1981 a retired headmaster opened a garden at Simmon's Reef composed mostly of rare exotic trees and plants, naming it Garden of St Erth. It included a miner's house dating from the heyday of Simmon's Reef. St Erth became an increasingly popular garden for day visitors, with masses of spring blooms which benefit from the cold winters like those in Europe. Blackwood's population also began to increase. Blackwood has a hotel, a general store, Anglican, Catholic and Uniting churches, mineral springs, a reserve, a caravan park and a mechanics' institute hall. The Garden of St Erth is on the Register of the National Estate.